Finally, cyclohexane is the most common paraffinic ring of all, partly because it is possible to form a conformation of cyclohexane having very little strain energy. However, it has enough flexibility that things become more complicated than in the other rings we have looked at. If cyclohexane were flat, the C-C-C bond angles would be 120 degrees, like the corners of a regular hexagon. That's too big for a tetrahedral carbon, so the cyclohexane uses its flexibility to adopt a shape in which this strain energy is relieved. There are many shapes that a cyclohexane could adopt. We will look only at two of them and use our basis set to think about which one is more stable and more likely. One of these shapes is called a "boat" conformation. In this conformation, the opposite corners of the cyclohexane ring are pulled up above the plane of the other four carbons, forming the prow and stern of a boat. Figure CA7.1. A highly strained conformation of cyclohexane. The bond angles in the boat are 109 degrees. The boat has no ring strain. There are torsional strains present along the two sides of the boat, although not at the prow and the stern. The boat conformation suffers from steric strains. 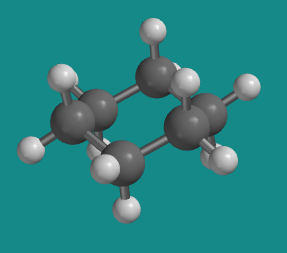 By pulling the carbons at the prow and stern up above the plane of the ring, the attached hydrogens get very close to each other. In our basis set, this is a six atom interaction. We count the number of atoms to assess the potential steric interaction, we start at one of these crowded hydrogens, go through the first to fourth carbon, and then finish at another crowded hydrogen. That's a total of six atoms including the two atoms that appear to be leaning towards each other, so this is a significant steric interaction. If we then look along one of the sides of the boat in a Newman projection, we find that the stern and prow of the boat actually eclipse each other, so this six atom interaction is pretty strong, about 1.5 kcal/mol. Add to that the 6 kcal/mol of torsional strain, from three pairs of eclipsed bonds on one side of the boat and three pairs on the other, and there is a total of 7.5 kcal/mol strain energy in the boat conformer of cyclohexane. In reality, the boat conformation would not occur if there were another conformation significantly lower in energy. The boat conformation is an unstable conformation because of both torsional and steric strain. A second shape is called the chair conformation. In a hand-held model, this shape can be obtained by grasping the prow of the boat and twisting it down below the boat, while keeping the stern in its same position above the boat. Figure CA7.2. 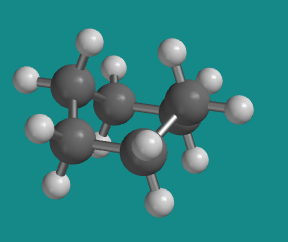 A low-energy conformer of cyclohexane. A thorough investigation of your model will show that there are no longer any torsional strains in this conformation. There aren't any steric strains, either, because although you can identify pairs of hydrogens that are six atoms apart from each other, these pairs always seem to be pointing well away from each other. In fact, if the model is viewed from above, so that it looks like a hexagon, six of the hydrogen atoms point directly outward away from the ring; they can't get much further apart than that. These atoms are all called equatorial hydrogens. The only atoms that get close to each other at all are the three hydrogens above the ring, which are all roughly in the same area of space, and the three below the ring. These atoms are called axial hydrogens. The worst steric strain in the chair is the 5-atom interaction between axial hydrogens. In our basis set, this interaction costs 0 kcal/mol. The chair is more stable than the boat by 7.5 kcal/mol. This conformation of cyclohexane is the preferred conformer. Cyclohexane is always found in the chair conformer. This conformer has no torsional or steric strain. The chair can be shown in a line drawing as shown below. Notice that three hydrogens point up from the chair and three point down. The other hydrogens are pointing outward from the center. Still pictures of models obtained using Spartan 14 from Wavefunction, Inc., Irvine, California.